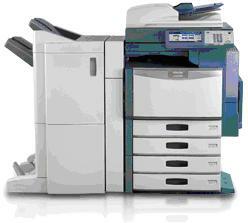 The e-STUDIO2040c/2540c/3040c from Toshiba bring mid-volume workgroups impressive color and high-volume black and white, including copy, print, scan and fax capabilities. Now, thanks to the integration of the new generation e-BRIDGE platform, features can be added later"similar to the way apps are added to smart phones. This platform also provides increased security, connectivity, manageability and energy saving. Yet another technological advancement from Toshiba.